Most people think of solitaire as a type of card game, but the name applies to any game played by one player. In this project, make a simple game board for the English version of board solitaire, sometimes called peg solitaire. No gluing is needed: just print, cut, and play. These boards can also be made more durable with optional materials. Learn more about the history and rules of board solitaire at the end of the project. Related crafts: There are many other versions of board / peg solitaire, including French Board Solitaire which is very similar to English board solitaire. 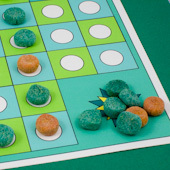 Also, see the Triangle Board Solitaire craft project for how to make a game board that uses marbles as game pieces using the Marble Tiles pattern. See the Fox and Geese Game Board craft project for how to make a roll-up game board from felt—the Fox and Geese game board is identical to the English Board Solitaire game board. Optional: Colored pencils or markers, glue, cereal box cardboard, and clear contact paper. Contact paper is self-adhesive shelf paper usually available on rolls in hardware and discount stores. Choose a design that prints in color, or select the black & white pattern and use your creativity to add color and designs. There is also a printable that shows one possible perfect win for English board solitaire. 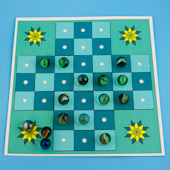 The Marble Tiles pattern is used to make the game board suitable for marble playing pieces following instructions in the Triangle Board Solitaire project. Use the Perfect Solution as a reference. Start with the piece on the space marked number 1. Jump over the piece pointed to by the arrow to the space beyond. Remove the jumped piece from the board. Continue making jumps in numerical order. The last piece will be in the square marked with the star. Tip: Make a longer-lasting game board with cardstock or computer paper glued to cardboard. If you can feed cardstock through your printer, print directly on it. Otherwise, print on computer paper. Color the game board with any colors you like. You could color the squares like a checkerboard with alternating colors. Pick two contrasting colors, or leave half of the squares white. Tip: If you printed the colored version of the board, you can still add a personal touch by decorating the border around it. Trim the printed pattern to a square shape with equal borders on all sides of the game board. Tip: You can also choose to trim in the shape of the board, or skip trimming all together. If you have printed on computer paper, you may want to glue the game board to cardboard. Skip this step if you printed on cardstock, or if you want to make a paper board. Tip: Be sure that the glue is spread from edge to edge and into the corners. Protect your board from getting dirty with clear contact paper. Cut two pieces of clear contact paper about ½" larger than the game board. Apply one piece of contact paper to the back of the board, and the other piece to the front. Be sure to center everything and to smooth out any air bubbles. Trim the contact paper, leaving a ¼" border. Tip: Contact paper is self-adhesive shelf paper, usually available on rolls in hardware and discount stores. You need 32 playing pieces to go with the English solitaire board. 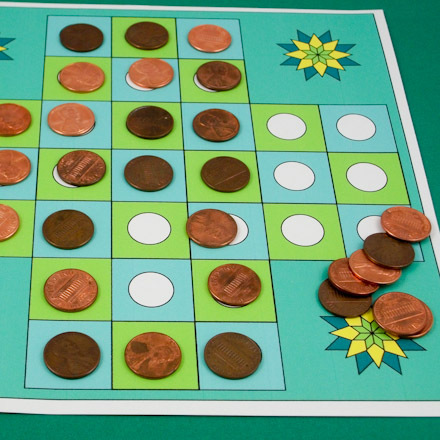 You can use pieces from other games, pennies, marshmallows, or cereal (Cheerios, Kix, Trix). The object of the game is to remove as many pieces as you can from the board. A big win is to remove all the pieces except one. 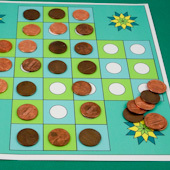 A perfect game is to leave the last piece in the center space that was initially empty. Place one playing piece in every space except the center one. All jumps are over an adjacent piece to an empty space beyond. In English Board Solitaire, the move cannot be on the diagonal. Continue making jumps and removing pieces until all possible captures have been made. To see a set of moves that results in a perfect game, use the perfect solution printable as a reference. To use the solution, start with the piece on the space marked number 1. Jump over the piece pointed to by the arrow to the space beyond. Remove the jumped piece from the board. Continue making jumps in numerical order. The last piece will be in the square marked with the star. That's it! You are ready to play a game of board solitaire! When was Board Solitaire invented? Board Solitaire is more commonly known as Peg Solitaire, and is called the hermit's game in Germany. The origins of the game are unknown, but it appears to be based on the older Fox and Geese board. 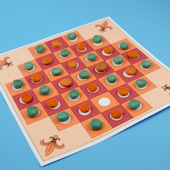 (See the Fox and Geese Game Board craft project.) One legend holds that a French nobleman invented the game while in solitary confinement in the Bastille. Board Solitaire was very popular in France during the 17th century, and is shown in engravings from 1697 and 1698. The first written reference to the game came in a 1710 paper by Gottfried Leibnitz for the Berlin Academy. It seems likely that the game was invented long before the 17th century. What facts backup this theory? The game has very simple rules. The English and French boards are similar to the Fox and Geese board, which is centuries older. There are many variations of the game, and the game is played in many different countries. The French play the game on a board with 37 holes. It is the same as the English board, but has an additional hole in each corner. The French game has more variations with goals other than simply removing the most pieces. One of these is Le Lecteur au milieu de ses amis. The goal in this game is to leave one piece in the center and 16 pieces in a circle around the outside edge. There are many other popular ending patterns like a cross or a diamond. Can you think of other ending patterns to try? The game was less popular in the 19th century, and was almost forgotten. In recent decades it has regained its popularity, and new versions of the game have been introduced. There are triangle versions of the game and some of the new shapes are diamond, double-diamond, and three square. Maybe you can design another shape? For one other design, see the Triangle Board Solitaire craft project. Tip: It's nice to print a design on the back of the game board. 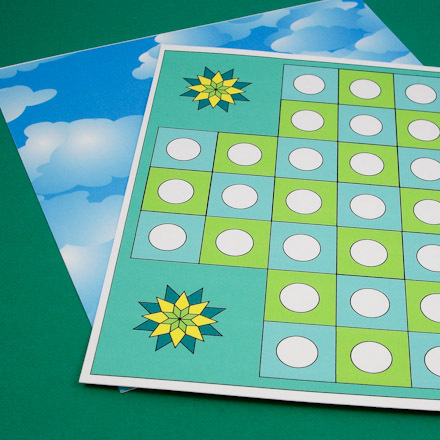 This game board has Aunt Annie's Clouds in Blue Sky ePaper printed on the back—use an ePaper of your choice. Tip: Laminate the game board with contact paper and use it as a placemat. 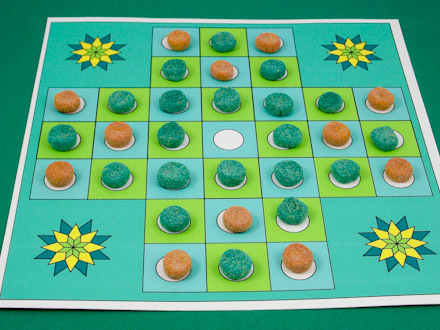 Tip: Use homemade modeling dough to make game pieces in colors that coordinate with your game board. 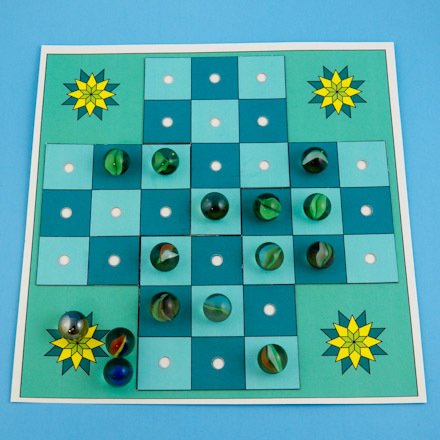 Tip: Use the Marble Tiles pattern to make a game board suitable for marble playing pieces. 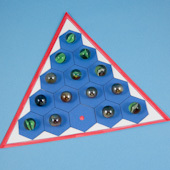 Follow instructions in the Triangle Board Solitaire project. Related craft: See how to make and play another version of board solitaire in the Triangle Board Solitaire craft project. 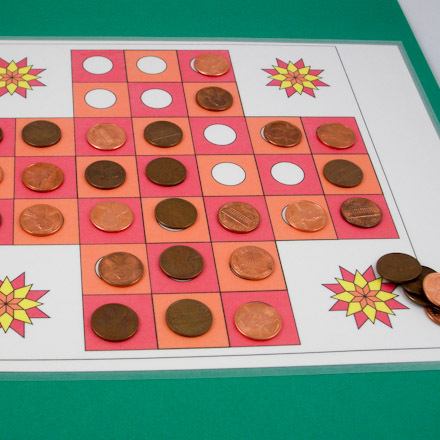 Related craft: See the French Board Solitaire craft project for another game of patience played on a board.